This statement caught me off guard. “In 2017? Really?” I thought to myself. Yet hundreds and millions of Africans lack access to clean drinking water, resulting in famine, poverty and many deaths, facts those of us who take clean water for granted should contemplate as we mark World Water Day on March 22. To shed light on an underreported issue, I recently traveled to Uganda with Sivan Ya’ari, photographed below, founder and CEO of Innovation: Africa, a humanitarian organization that uses Israeli agricultural technology to supply clean water and solar energy to remote African villages. It’s a not-for-profit that has installed 130 projects in seven African countries, improving the lives of nearly 1 million people. Sivan Ya’ari, founder of Innovation: Africa, shares a drink with a satisfied client. It became apparent during our trip that the main victims of the water crisis are women and children. They spend countless hours each day searching for and collecting water in jerry cans that they then must lug back to their families. The water hunters travel long distances, and their liquid quarry is often dirty and contaminated. Not only does this affect health, it also keeps children out of school, and robs adults of the time to find work. The result? Perpetual poverty. Ya’ari first came to Africa two decades ago, at age 20. The distressing living conditions she witnessed inspired her to enroll at Columbia University, where she earned a master’s degree in international energy management and policy. Many remote villages in Uganda lack electricity. Ya’ari keeps a very tight schedule; She works around the clock, visiting village after village, with her team of Israeli and local professionals. Whenever she arrives at a new village, songs and dances greet her. If you listen carefully, you can hear one word repeated often: “Israel.” Through her mission, Ya’ari serves as something of an informal ambassador. Women and children in some Ugandan villages must spend precious time lugging around jerry cans of water. One of our stops in the Karamoja territory held a particular historical significance to Israelis. In 1903, British colonial secretary Joseph Chamberlain suggested the area to Theodor Herzl as a potential Jewish homeland. The plan was eventually rejected at the Seventh Zionist Congress in 1905, and I wondered what our team would find there, more than a century later. Karamoja is the driest part of Uganda, prone to extreme periods of drought and famine. In 1980, one of the worst famines in history occurred there, killing 21% of the population. As we continued to drive on unpaved roads, houses turned into straw huts, the local people looked thinner and thinner. This was my first exposure to extreme poverty, and the farther we drove, the reality worsened. Heavy famine and drought pervaded the area. We met locals who were forced to eat leaves and mice to survive. A Ugandan boy is parched no more. Much of their energy was devoted to gathering water from stagnant puddles or from sources where wildlife also drank and defecated. The sense of sheer hopelessness was unshakable. However, unlike me, Ya’ari is no stranger to these conditions, nor is she disheartened. She carries on, knowing that soon there will be clean drinking water here, too, and this parched land will, eventually, be transformed into a lush haven. 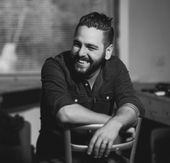 Lior Sperandeo is an Emmy-nominated cinematographer from Tel Aviv. Watch his videologue of his trip here. This story "These Riveting Photos Show Israelis Helping Africans Find Clean Water" was written by Lior Sperandeo. Lior Sperandeo is an Emmy Award nominated Cinematographer from Tel Aviv. He started his career as a News Cameraman covering Jerusalem & the Middle East, and later shifted to the documentary world. In his latest project “PeopleOf,” Lior highlights different human and social struggles around the world, creating a tool and voice for muted populations.